The art of the motto is not one at which I am skilled. But I like to think that I can spot a good one when I see it. I like the motto of Bown’s Best – Me Meliorem Fieri. It means, of course, That I Might Be Better, a not inappropriate aspiration for someone seeking the best. Above the door of Hambleton Hall is carved in stone another good one. Indeed, it must surely be the perfect injunction for anyone about to enter one of England’s most famous country house hotels: Fay Ce Que Voudras – Do What You Want. 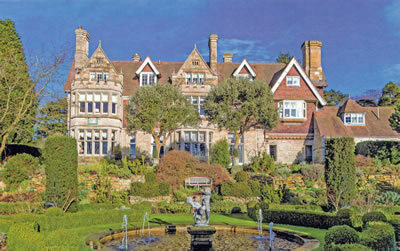 Hambleton Hall is in Rutland, the tiny county which was wiped off the map by nasty politicians in the 1970s and which thereafter – to general rejoicing – was resurrected. The Hall was built in 1881 by a brewer, Walter Marshall. Later it was owned by Eva Astley Paston Cooper. She liked the company of ‘theatricals’. They did not always repay her hospitality with conspicuous kindness. Noel Coward, a frequent guest, described his hostess thus: “Mrs Cooper was gay company. Her principal pleasure was to lie flat on her back upon a mattress in front of the fire and shoot off witticisms in a sort of petulant wail.” I fancy there has been no wailing since 1979, when the Hall was opened as a luxury hotel by Tim and Stefa Hart. They were determined to create somewhere special (getting in Nina Campbell to do the interiors, for example), and they succeeded in the most triumphant manner. Hambleton is regarded as a model of its kind. Mr Hart and I share the same Cambridge college. A Jesus man who read Moral Sciences is likely to be charming, intelligent and articulate, and Mr Hart is all three. 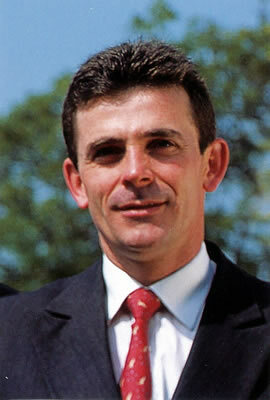 These qualities, together with his enthusiasm for good wine, make him the ideal hotelier. Upon arrival, my first sight of the Hall had given me a strong sense of déjà vu. I suppose it was the architecture: a rambling confection of stone and red brick, tiling and gables – the sort of Norman Shaw Queen Anne Domestic Revival style which has played a large part in my life. Surely this was a prep school? (Although, had I thought for a moment, I would have realised that no headmaster worth his salt would have permitted that hedonistic motto to remain over the front door.) Once inside, however, all impression of an educational institution has flown away. 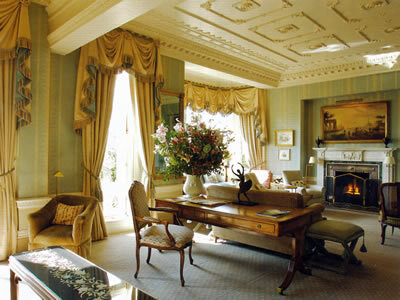 No prep school I know is full of fine rugs, good oil paintings, plump sofas, sumptuous drapes and crackling log fires. No need to prepare those Latin verbs, then. I will say a word here about the staff. Everyone I met at Hambleton proved exceptionally friendly and courteous. This spoke well, not only of Mr Hart, but also of his General Manager, Chris Hurst (pictured, in a check shirt) and of the Restaurant Director, Graeme Matheson (pictured, with a red tie). I lodged on the first floor, at the top of the house’s grand staircase, in The Middlehurst Room (pictured - a ‘master’ room and therefore £380-£440 a night, bed and breakfast for two). 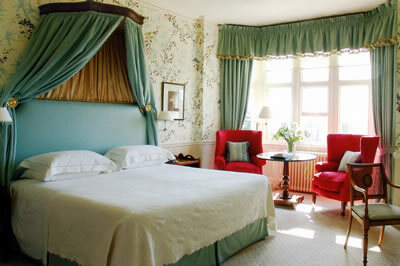 Through outer and inner doors I entered a light and spacious bedroom with blue wallpaper of leaves and flowers. The antique chest of drawers in mahogany, the canopy over the bed and the wing chairs upholstered in red imparted a pleasing sense of dignified comfort. Through the large bay window I could look over the sloping gardens to the glistening surface of Rutland Water and on to the rising land on the other side of the valley. In the bathroom were spotlights, engravings of fish, two wash basins, the loo and a large tub with a shower over. All in all, this was exactly the sort of accommodation you would want in a country house. 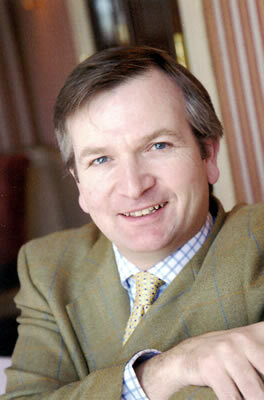 Hambleton is in the middle of hunting country – specifically, that of the Cottesmore. It is also very close to the Belvoir, the Quorn and the Fernie. But my own pleasures are less vigorous. Here it was a joy to sit, look at the view and think about dinner. Chef Aaron Patterson is a local lad who, as the saying goes, has made good. For his culinary talent means that a Michelin star twinkles over the kitchen at Hambleton Hall. His approach is to take British, often very local, ingredients and to prepare them with the best French technique (with which he is certainly familiar, having worked in such famous kitchens as that of Le Crocodile in Strasbourg). The menu appealed to me enormously. Indeed, I think I could have worked through every single dish with massive enjoyment. A five-course tasting menu is offered for £75. Three courses from the carte are £65 (with some dishes attracting supplements). The dining room is as sophisticated and elegant as the rest of the Hall. At dinner I sat next to an oil painting which might well have been a work by Sir Peter Lely, artist to Charles II. Before me was white napery and on the tablecloth stood good glassware by Riedel. On my table, as on each table, was a single candle. From the kitchen the waitresses in black waistcoats brought to me some very impressive food. Sommelier Dominique Baduel from South West France presides over a list which offers 370 bottles, including 26 half-bottles and 17 larger bottles. Prices run from £22 for a white Côte de Gascogne to £1,100 for 1982 Cheval Blanc and £1,450 for 1990 Musigny (J.F.Mugnier). France dominates the cellar – with 1990 Dom Pérignon (£276), 1985 Mouton Rothschild (£500), 1990 Gruard Larose (£320) and 2005 Grange des Pères (£172, magnum); but there are temptations from elsewhere, like 1996 Tignanello from Italy (£281) and 1996 Penfolds Grange from Australia (£605). My own drinking demonstrated the skill and knowledge of Mr Baduel, for his recommendations were spot-on. A glass of Kumeu River chardonnay – a wine from New Zealand I first ‘discovered’ decades ago, and of which I have been a fan ever since – had exactly the right balance of fruit and acidity for my first course. And the bottle of red from Italy was a triumph, packed with ripe damsons in its rich, port-like density (Aglianico del Vulture Riserva, Piano del Cerro Basilicata, 2008 - £44). Well done, that sommelier. Breakfast was back in the dining room. I love the breaking of the fast, particularly when – as at Hambleton – the highest culinary standards are maintained. The plate of smoked haddock with sautéed mushrooms, brought from the kitchen, was a treat. To this I added, from the buffet, bowls of cereal and fruit salad, and cinnamon buns with raspberry jam, and to my table the waitresses brought pots of coffee, dishes of ice cubes, glasses of freshly squeezed orange juice (and it really was freshly squeezed) and slices of crusty toast. All this I consumed off crockery made by Villeroy & Boch, decorated with flowers and rose hips. Fay Ce Que Voudras. And, indeed, I had done what I wanted. I had rested in luxurious comfort, eaten magnificent food, drunk fine wines and been surrounded by the best of the English countryside. Hambleton Hall has its motto right.